Given that most of Krakow’s oriental restaurants are run by Vietnamese families, it’s always been a little surprising to me to see that the food served here doesn’t really resemble the fresh, clean tastes I’ve experienced in Vietnamese restaurants elsewhere, let alone the street food served in Asia. I’m not talking about Krakow’s high-end oriental restaurants (you know, those where you have a fleeting thought about whether you should dress up), more about the small, family-run places where you’d stop by for a quick, reasonably-priced bite to eat. While I know that recipes have to be adapted to fit in with local tastes and the availability of ingredients, the Asian food I’ve come across in Krakow seems to be going a step too far. The Vietnamese have an interesting relationship with Poland, stretching back over 50 years. My Vietnamese friends told me that they learnt about the epic Polish struggle against communism while still in Vietnam and as a result, they developed a soft spot for Poland. The first emigrants arrived in Poland in the late 1950s during the Vietnam War, as part of an education programme agreed by the communist Polish and Vietnamese governments. Between the 50s and the late 80s, contact with foreigners was forbidden, so the next group of Vietnamese economic and political migrants didn’t arrive until after 1989. Poland is now the third most popular country for Vietnamese migrants after France and Germany, and Poland’s Vietnamese community is thought to number 30-50,000, with over half living in Warsaw. Vietnamese cuisine is regarded as one of the healthiest. A typical meal will consist of steamed rice or noodles, a soup that is eaten with it, a meat or fish dish and a vegetable dish. Using a lot of vegetables and herbs and as little oil as possible to preserve freshness and flavour, it’s a nutritionist’s dream. I’ve heard that the only place to go to get authentic Vietnamese food is Warsaw, where new restaurants are doing a roaring trade with both Poles and Vietnamese, so I met with one of the young owners of Dong-A on ul. Miodowa to find out what’s going on in Krakow. A small and perpetually busy “Bar Orientalny”, Dong-A has been run for the last 10 years by a Vietnamese family who serve 100-200 customers a day, around 70 percent of whom are regulars who order the same thing day in, day out. When I asked them if they ate the same food at home as they cooked for their Polish clients, they laughed and admitted that there was a big difference. According to them, their Polish customers have very definite views about what “Asian” food should be like: a soup, followed by a meat dish and rice. This sounds like a typical Polish lunch to me. Apparently Poles don’t like some of the stronger flavours that are common in traditional Vietnamese dishes, fish sauce for example, so it gets left out. 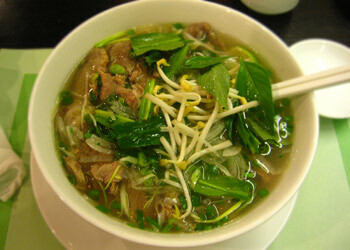 This is why the legendary Vietnamese soup, phở (pronounced “fah”) is rarely found on any Vietnamese-run restaurant menu in Krakow and even when it is, it does not resemble the real thing: a deep flavoured, slow-simmered spicy beef broth with rice noodles and shredded meat or chicken served with a plate of bean sprouts, fresh herbs, limes and chilli peppers. It’s a delicious meal in a bowl. I asked Dong-A whether they would consider adding some traditional Vietnamese dishes, such as phở, to their menu and received an unconvinced response. “Polish people don’t like to eat like Vietnamese people”. I’m not so sure. Times have changed and I suspect that there’s a growing group of Cracovians who would welcome some more authentic Vietnamese food. The only solution seems to be to start asking for it, and I got the feeling that Dong-A might just be open to the idea. You might not get real phở the first or second time but who knows, if enough people ask, maybe it will catch on.